I have two e-mail accounts. A personal account (Gmail) and a work account (whateverdomain.com, obviously a fake example). Currently, I am already handling both from Gmail, but there's a couple of issues I don't like and I was wondering what's the best way to go. The current way I get e-mail on Gmail is by setting up a POP3 account on Mail Settings. 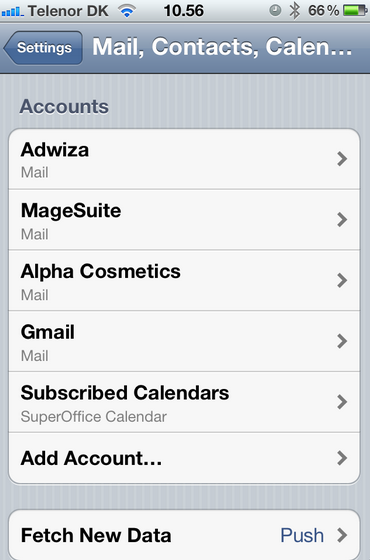 This allows me to receive and send e-mail from Gmail and all e-mails (sent and received) are stored on the account. First problem: when an e-mail is sent to hi@whateverdomain.com there's a big delay since Gmail only checks its external POP3 accounts every half an hour or more. Since work e-mails are potentially urgent that makes my solution a bad solution. Second problem: on the iPhone... I suffer the same problem. If I setup the work email via IMAP then I have two accounts meaning emails written from whateverdomain.com are not stored in Gmail. If I only setup the Gmail account and use the comma trick so my work mail appears on the from field then emails are saved but appear as "whateverdomain.com via gmail" which doesn't look very professional. Google treats the retrieving of external POP3 accounts using their own algorithm and that says in sum that, if you get many email, it will fetch with small gap times, if you have emails once upon a time it will expand the recurring time as there is no need. This will make sure that you do receive as fast as you can (as it's at the same time it reaches the POP3 server) and if you configure your GMAIL to filter all emails that were sent to your whateverdomain.com you can easily flag them and even forward again, but this time using GMAIL. Just add your Gmail and your POP3 Account. If you use a Forward account, you cant set up a new POP3 account, as it's not a POP3 account anymore and you are not keeping anything on whateverdomain.com just in your forward email. 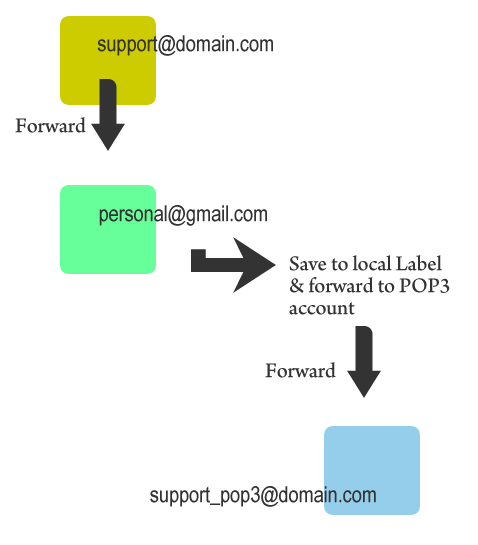 If you need to keep things in the POP3 Account as well, I would suggest that you create a new POP3 account and on GMAIL (that receives the forwarded Email), create a filter to Forward it again to the new POP3 account (or a new GMAIL account just for this, for example as the basic storage size is always a little bigger than regular POP3 account sizes). For the first problem, the easiest solution would be to set up an auto-forward for all your emails @whateverdomain.com to forward to your gmail, meaning they would appear instantly. If you're on Outlook/Exchange, just set up a Rule to forward all emails to that address. Or, if you're on a Linux/Unix based system, set up a .forward file or similar. As for the second problem, this is a bit trickier. You can set up a custom SMTP server to send emails through so that they don't appear to be from GMail. First you need to make sure you have added your @whateverdomain.com email address to GMail... I assume you've done this already. Go into Account Settings, Edit Info on your @whateverdomain.com address, go to the second step and enter the SMTP settings for your @whateverdomain.com address (might need to check with your company what these settings are and if you need authentication etc). Save changes. Now, when you send email from @whateverdomain.com it will not appear as if it's from GMail. Not the answer you're looking for? Browse other questions tagged gmail google-apps iphone or ask your own question. Retrieving mails from deleted/disabled Gmail work account?